"Classic purple pickled eggs. This brings back such fond memories of every Easter and Christmas at my grandmothers. This is easiest recipe I know and we no longer do it any other way." Place egg in a saucepan and cover with cold water. Bring water to a boil and immediately remove from heat. Cover and let eggs stand in hot water for 10 to 12 minutes. Remove from hot water, and cool under cold running water. Once the eggs cool for a bit, roll the eggs back and forth on the counter to crush the shells, then return to the cold water for up to an hour. They will peel very easily then. Place the peeled eggs in a large bowl or large wide mouthed jar with a lid. 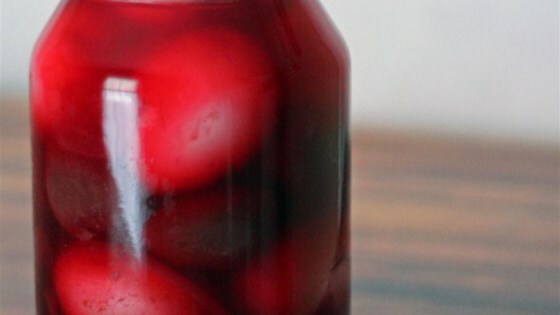 Pour in the pickled beets and juice. Add onions if you are using. Let them set in the refrigerator for at least 24 hours - 2 days is best if you can wait that long. Turn jar or stir once or twice to be sure that the eggs are evenly colored. Slice eggs in half and arrange on a tray to serve. This simple Southern snack is a cinch to prepare. Are you serious? Where the heck is the vinegar? Well, it was really difficult to wait 2 days but I did! We thought these were very good, I did add minced garlic. These make such a great 'on the run' snack for me! I tasted one after 24 hrs, and decided to add some apple cider vinegar as I like a bit of a twang to my pickled eggs. They were ok. I doubt I'll make them again.